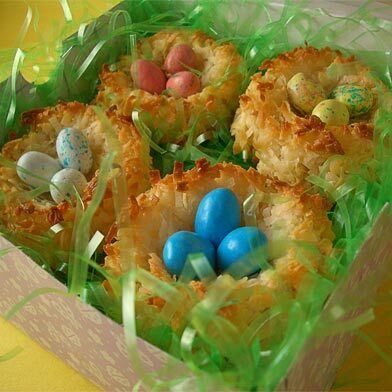 These cute Coconut Macaroon Nests are a quick and easy Easter goodie sure to please! Start with a basic coconut macaroon dough. Using a medium scoop, scoop out balls of dough and place on baking sheet lined with parchment or silpat. Make an indent in the middle of each ball to create a “nest” shape. Bake until golden brown. Remove from oven and immediately place three malted milk ball “eggs” into the “nest” and let cool. Package in cute boxes filled with Easter grass!